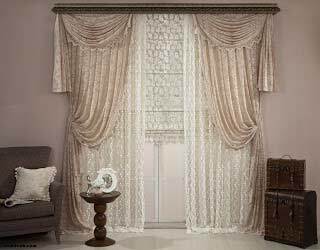 how to choose the best hall curtains designs and hall curtain ideas, and what is the fashionable curtains for a hall and living room in 2019, new curtain styles and colors for the hall. 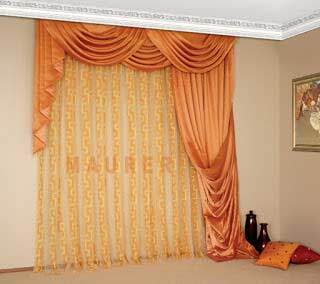 Curtains - a stylish and bright accent design of any modern hall. What trends did the year 2019 bring? 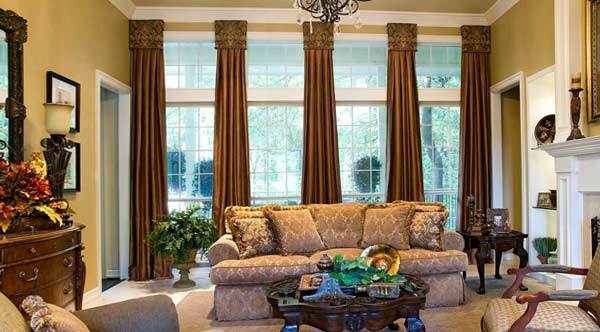 What types of curtains and color options are in fashion? We will tell about all the designer novelties. 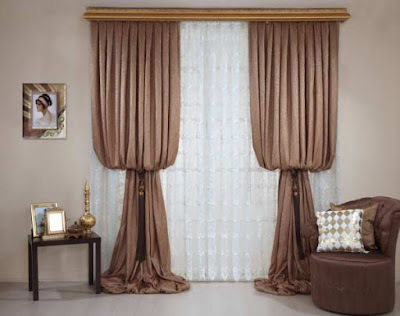 Curtains have long ceased to be just a piece of cloth, designed to protect the room from excess light during the day and hide it from prying eyes at night. Modern curtains - this is the same equivalent element of decor, as a stylish vase or an interesting picture. So, to choose the curtains for any of the rooms in your apartment you need to take very seriously and take into account the main trends that prevail in the design environment. So, do you want to embody in your not only stylish but also fashionable design? Then let's see what advice on choosing curtains for the hall to give us designers in the coming year. The general trend in the world of design, which is gaining popularity with each season, is the desire to choose the most natural materials. This applies to finishing materials, in the selection of which we are increasingly called upon to pay attention to eco-friendly wood or MDF (to whom that is affordable), and materials used in the decoration of the hall - decorative panels, textiles, etc. Thus, a preferable choice will be curtains made from natural materials - variations from cotton, flax, silk and other vegetable fibers. 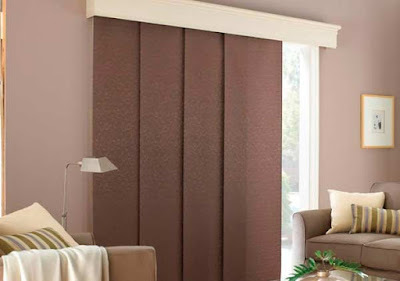 Nevertheless, nothing prevents you to choose a fabric more suitable to the general style of your hall. Velvet The basis of the fabric can be silk, cotton, nylon. Through the base are stretched villi - short and thick, giving velvet a special texture. Taffeta Made from silk or synthetic fibers. By texture - heavy, rustling, smooth. Has a flickering surface. Mora - most often made of silk, has a wavy iridescent pattern. Jacquard - It is made with an intricate weaving, has an interesting ornament. Brocade - Jacquard weave, three-dimensional, textured patterns. Satin - It consists of cotton fibers, has a light shine. Jute - A rather coarse cloth made from natural vegetable fibers of jute. Veil - Usually cotton or silk, has a light texture with sewn patterns. Chiffon - The derivative of silk fibers, thin, transparent fabric. Tulle - A thin fabric with a mesh structure. 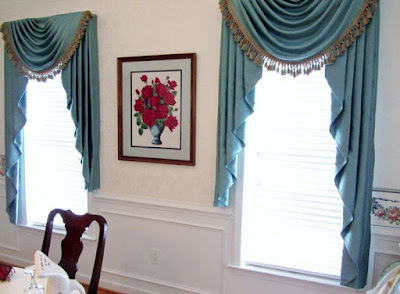 What type of hall curtains are in the trend? Modern interiors like space. Even the popular loft style has recently become more and easier for designers with the help of light curtains made of thin transparent fabrics. 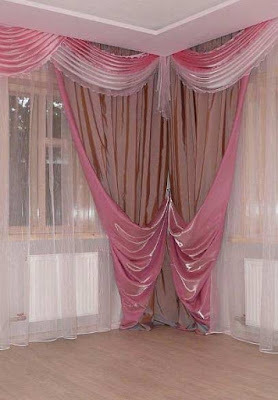 Tulle, chiffon, veil - these are the materials that will allow you to create a wonderful and weightless interior. 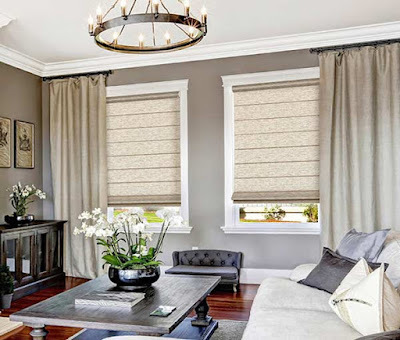 By the way, despite the fact that white color is the most fashionable choice of the 2019 season, no one limits you in choosing the color for curtains in the living room. Bright and juicy natural shades will perfectly lie on the weightless structure of curtains and will become a weighty accent of its modern interior. It would seem that the volume curtains and the use of drapery - a trend that directly contradicts the previous one, urging us to abandon the complex curtains decor in favor of ease and simplicity. But not so simple! we will explain; For those who do not know, eyelets are rings made of metal or plastic, thanks to which the curtain is threaded onto the cornice. Such curtains look very original and in themselves are an interesting decor subject even in monochrome without additional prints. The use of eyelets is possible not only for curtains made from a dense material but also for light fabrics. 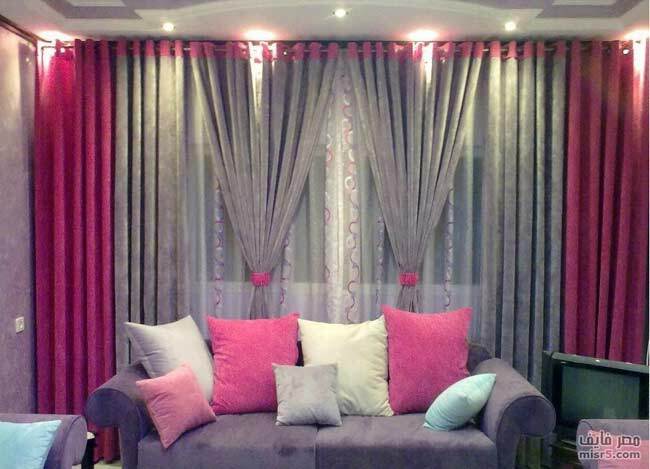 Just compact the top layer of the curtains with any suitable material of a dense texture. 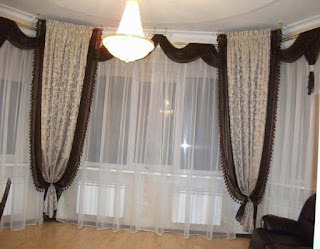 Roman curtains for hall have recently been fully used in the design projects of the living room and hall. This option is not only practical, but also very interesting. What are their main differences? 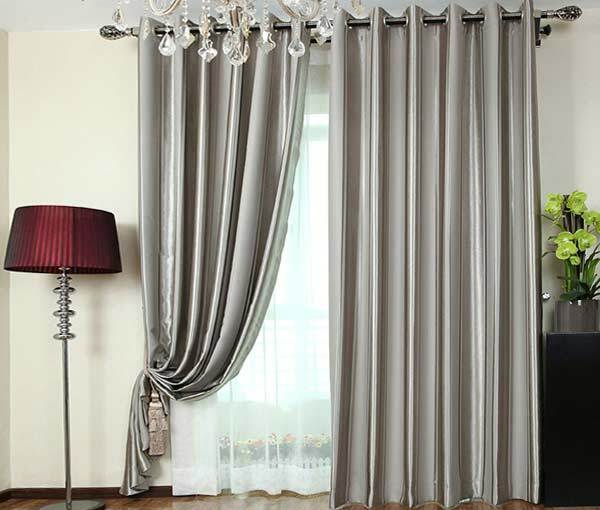 Reflective Roman curtains for halls are made of fabrics capable of reflecting light. The use of this option will be more justified in the bedroom or the nursery, where extra light is perceived as a hindrance to rest, but not for the hall, especially the modern one. Light-scattering Roman blinds, on the other hand, disperse the light that hits them and is well suited for use in living rooms. 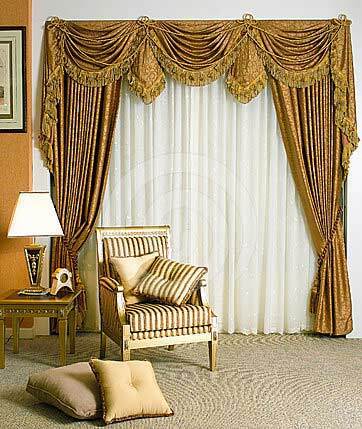 Roman curtains of the "day-night" type are an excellent compromise. 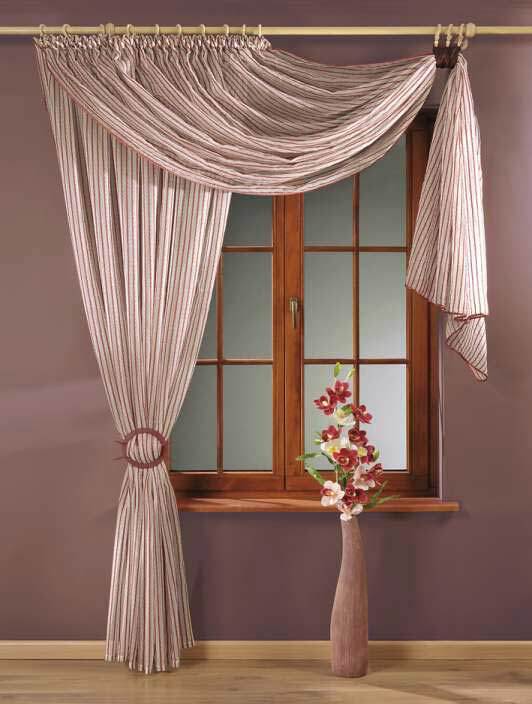 Their peculiarity consists of alternating strips of dense and lightweight fabric (therefore they are often called curtains of the "zebra" type). 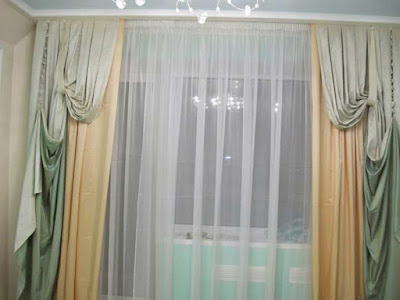 Such curtains are attached in two layers with the ability to adjust the arrangement of strips on both layers. 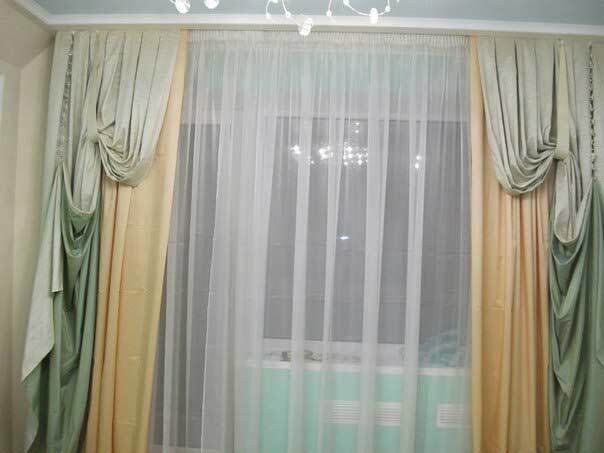 For example, if you wish to darken the space, simply adjust the curtains so that the dense strips of one layer overlap the transparent strips of the second one. Accordingly, in order to let more light into the room, it is necessary to combine strips of the same type as each other. Roman curtains in the interior of the room can be perfectly combined with classic curtains of any type - as their dense, opaque materials, and lightweight transparent fabrics. Japanese curtains - a fashion trend in the design of the hall in 2019 and that there are several explanations. The national color and the element ethnics in the design has recently become more popular. Japanese style is minimalistic, and minimalism - in favor with designers is not the first season. Since the curtains are an additional decor, choosing curtains of Japanese design is the right way to add an interesting accent to your room. Season-2019 develops the desire for simplicity, inherited from the year 2015. Use in the design of the premises of the base tones, such as gray, black, beige and - especially! - white - the main leitmotif of fashionable design projects. Universal white color will perfectly cope with the task of facilitating heavy interiors, will make a fresh note, transform a small living room. Such a choice is suitable for those who do not want to focus on textiles but prefer to diversify the interior with other bright colors, be it furniture or interesting fixtures. 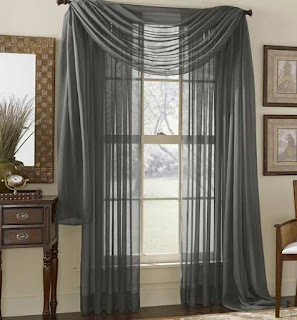 Dark curtains - another classic option that can make the interior a bit stricter. 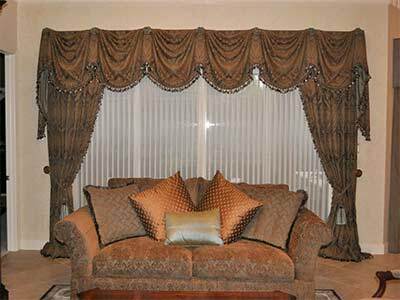 If you choose dark curtains, choose them in a tone upholstery furniture, lampshades of floor lamps or the color of sofa cushions. As for the ratio of the colors of the finishes and curtains in the modern hall, here the designers give us a certain scope for creative ideas. 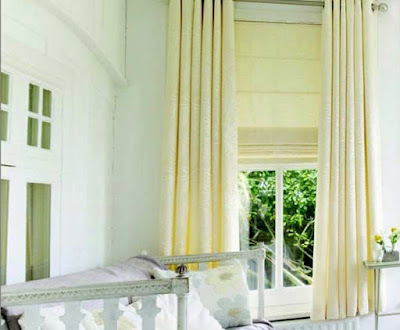 Equally stylish will look like curtains, matched to the tone of the main finish, and playing with it in contrast. Color hall curtains will easily make your room more interesting, so do not be afraid to experiment with combinations. The eternal rule of "curtains in the tone of textiles" is no longer dominant. Pick up the curtains in tone to other decor elements or, if you do not use a monochrome gamut. Revive the interior of the hall with bright curtains of natural tones, and it will not only be a great place to relax, but also a place that gives you a charge of positive energy! 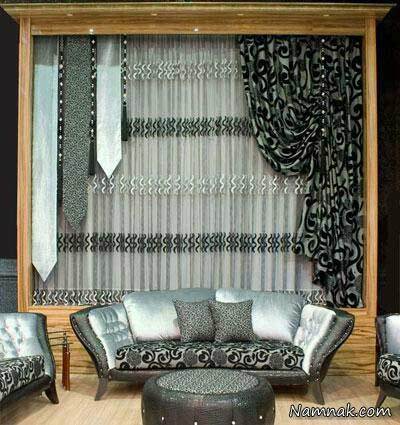 If monochrome curtains, even saturated natural shades, seem too boring to you, designers have something to offer you in the coming year 2019. So, what patterns are the most fashionable this season? As you can see, the space for imagination is great as ever! Duplicating the pattern of curtains in other elements of the decor will help you to combine them all into a single space of the hall. More details about the fashion in this season styles of decoration of the hall, we have already written. 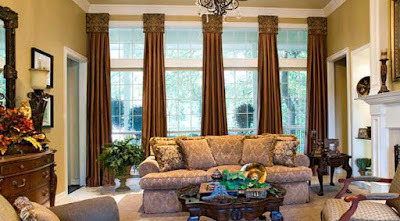 Let's consider in detail which curtains are better for fashionable interiors. Eclectic style is extremely popular in the upcoming season! The combination of the incongruous, performed with a sense, sensible and competent arrangement is the key to creating a truly unique interior. Do not think that creating an interior in the style of eclecticism is easy, and for this, it's enough just to combine elements of different styles in one space. The correct and stylish eclectic interior does not leave a sense of excess, and it is often only professionals who can achieve this effect! Picking curtains for the hall in the style of eclecticism, it is worth paying attention to the options with interesting prints and patterns. The best solution will be large flowers and geometric shapes. Just fine fit the curtains in stripes or with futuristic patterns. Minimalism implies laconism in the design of upholstered furniture and storage system facades, the use of simple light colors in decoration with bright accents, as well as the rejection of excessive decor. Ideal solution for the hall in the style of minimalism will be simple light curtains of light colors (ideally, white). Perfectly fit in such an interior of Roman curtains and emerging at the peak of popularity Japanese curtains. The very name of this style assumes maximum use of natural materials in decoration, furnishing, and decoration of the room. Having started the arrangement of the hall in an eco-style, refer to curtains made of natural materials, such as cotton, linen, silk, etc. The color scale is also better to choose natural - shades of white, beige, gray, green, blue, yellow will suit. It is acceptable to use prints and patterns that have a connection with nature. For example, in this style will perfectly fit in the current season's popularity of photo-curtains depicting exotic flowers, plants or animals. Art deco - the style of the glamorous elite of the mid-20th century. The smoothness of the forms, chic and simplicity are harmoniously combined in the hall in the style of art deco. After completing the general decoration of the room in light colors, give preference to dark furniture, in the tone of which it is worth picking up and curtains. Art deco accepts the use of not only monochrome curtains, but also interesting patterns, more often geometric, mentally returning us in the era of Golden Hollywood, which gave us this wonderful style, currently experiencing a new heyday. The choice in favor of pop art in the design of the hall will allow you to look at its space from a new angle. As a background for experiments, it is best to choose a neutral color scheme, preferably in white tones. 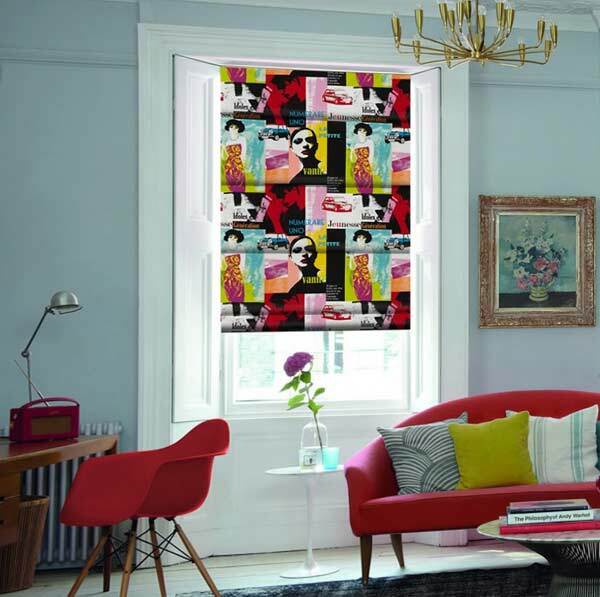 Accents in the interior in the style of pop art are arranged with an interesting decor, and curtains will perfectly cope with this task. Pop art - this is the case when you should not be afraid of juicy shades and screaming prints. The main thing is that the final result, like in the case of eclecticism, should not be excessively overloaded with details that do not allow the whole picture to be fully perceived. Finally, we can not fail to mention the classic, because of the classic, as you know, never goes out of fashion. So now - in the coming season there will be a place for a living room in a classic style. If the "classical" is too heavy for you, refer to the options of neoclassical design, which, preserving the traditions of classical interiors, looks more fresh and organic in modern space. hall curtains 2019 for this style will fit voluminous, with drapery. But do not forget about the usual, the simplest curtains, which can be skillfully combined with Roman ones. Modern apartment layouts often combine two zones - a kitchen and a living room. Someone does not like this option, someone, on the contrary, likes the combination of spaces of different purposes into a single whole. But anyway, such a layout is a frequent companion of modern apartments, which means that the question often arises: how to choose curtains for a similar room? to unite the zones into a single space. In the first case, we still recommend the use in the decoration and design of different areas of materials of similar texture and color scale, so as not to cut the room into two pieces, as it can play a cruel joke with you, making the space of the room visually less. 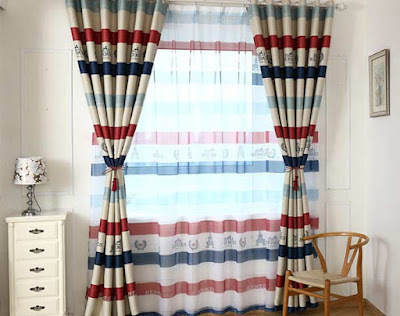 Choosing a decor, choose, for example, classic hall curtains or curtains on the eyelets for the living room curtains parts and Roman curtains for them in tone for the kitchen part. 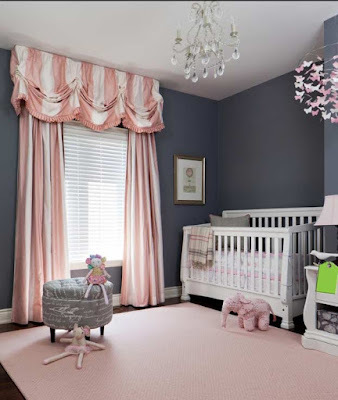 In the second case, you can decorate the zones in one color using a similar decor, and the hall curtains for the windows in the kitchen area and in the hall area should be the same. 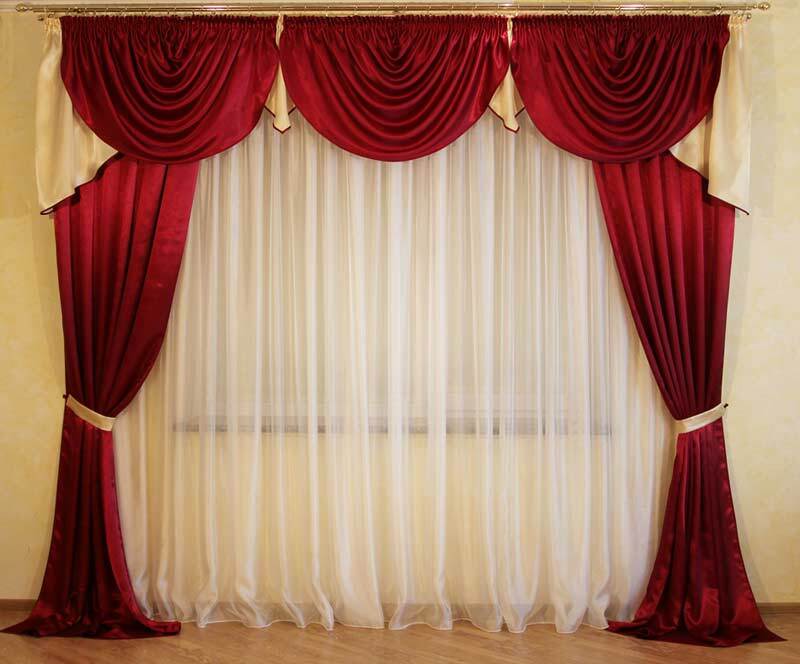 If you have needlework skills, then you can easily cope with the tailoring of hall curtains yourself. But even if the decision to sew the blinds yourself visited you for the first time, you are quite able to cope with this task. Fortunately, at present, the Internet is full of various master classes for sewing curtains. 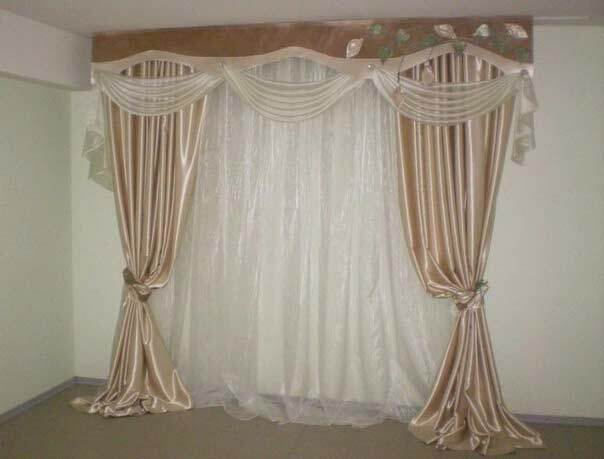 We offer you one of these master classes, as a result of which you can sew the classic curtains for your living room yourself. Dissolve the fabric. Decide on the required length, to which should add a total of about 16 cm - 10 cm at the hem of the bottom and 6 cm for the tape (maybe you tape will have a different width). Select the desired width of the processing of the sides of the future curtain after it is cut. Lay off the desired bend (1.5-3 cm) - iron, then make another bend - and just iron. Stitch the sides of the sewing machine. Begin processing the bottom. It is similar to the processing of the sides - the algorithm of actions is the same, but the bend should be 5 cm each time. Now you need to sew a curtain tape. 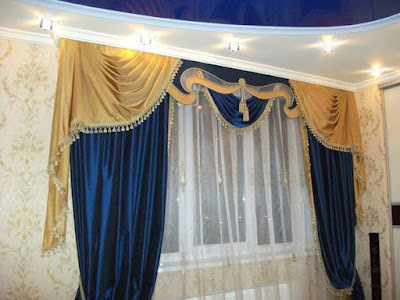 The curtains are placed face up, the sidecut of the curtain tape is bent to the wrong side by about 1-2 cm. Next, the curtain tape is sewn upwards on the front side of the blade with its loops and the upper slices are combined. 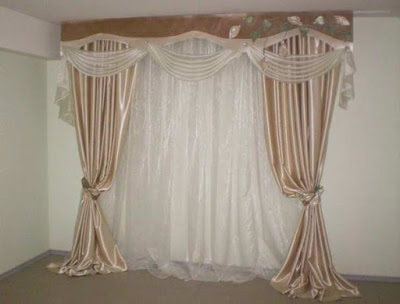 For convenience, we advise you to pin the ribbon to the curtain with the help of pins and do it in staggered order. Cut the tape 2 cm longer than the length of the curtains, and fold the excess into the inside. Attach the curtain tape along the inner edge approximately 1 mm from the edge. After that, bend the curtain tape to the wrong side of the fabric and tie it along the bottom edge. Another line is made in the middle of the curtain tape, paying attention to the fact that the hinges and threads of the curtain tape are not stitched. Further, the strings from both sides of the blind tape are tied in one knot and, pulling them, we give the curtain the necessary width. Classic curtains for the hall are ready!